© 2019 Henry Schein One. All rights reserved. No part of this publication may be reproduced, transmitted, transcribed, stored in a retrieval system, or translated into any language in any form or by any means without the prior written permission of Henry Schein One. © 2019 RealCloud Imaging, Inc. All rights reserved. No part of this publication may be reproduced, transmitted, transcribed, stored in a retrieval system, or translated into any language in any form or by any means without the prior written permission of RealCloud Imaging, Inc. Your license agreement with Henry Schein One, which is included with the product, specifies the permitted and prohibited uses of the product. Any unauthorized duplication or use of Dentrix Ascend, in whole or in part, in print or in any other storage and retrieval system is forbidden. Dentrix Ascend and the Dentrix Ascend logo are registered trademarks of Henry Schein One. Henry Schein One and its logo are trademarks of Henry Schein One. 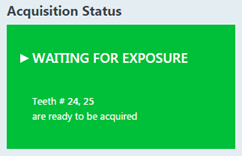 The Dexis imaging software, product names, and logo are either trademarks or registered trademarks of Dexis, LLC. The Planmeca imaging software and product names are either trademarks or registered trademarks of Planmeca USA, Inc.
You can find the UDI (Unique Device Identifier) followed by the current version number of Dentrix Ascend Imaging by doing the following: on the Developer Tools panel (in Chrome) or on the Web Inspector panel (in Safari), select the Console tab, and then open Dentrix Ascend Imaging. A line of text similar to "Ascend Imaging: (01)00864058000302(10) 1.1.6911.29768 12/3/2018 4:32 PM US" appears. 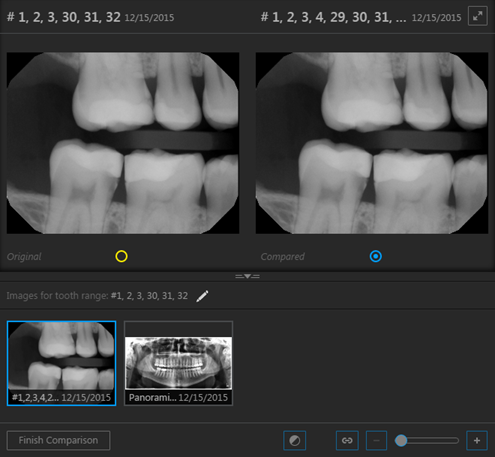 Dentrix Ascend's digital imaging solution is a cloud-based 2D and 3D dental imaging software module that interacts seamlessly with the Dentrix Ascend practice management program to provide efficient and versatile image management. 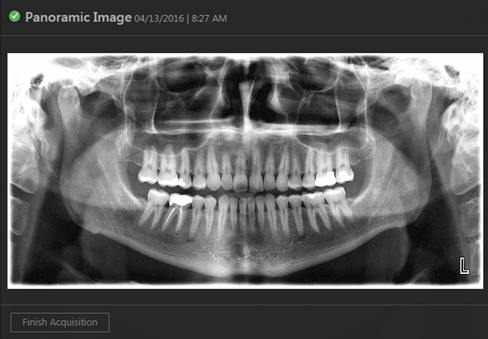 Dentrix Ascend Imaging manages intraoral and extraoral X-rays/volumes as well as intraoral and extraoral color images produced by intraoral video and/or consumer digital cameras. 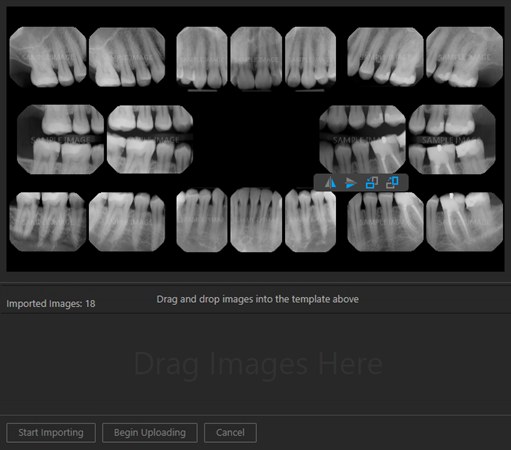 Because Dentrix Ascend Imaging is a web-based imaging software application, you can use it with Windows, Mac OS, iOS (iPad), and other operating systems in a supported, HTML5-compatible internet browser. 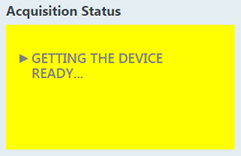 Important Note: You can use the iPad non-diagnostic purposes only. 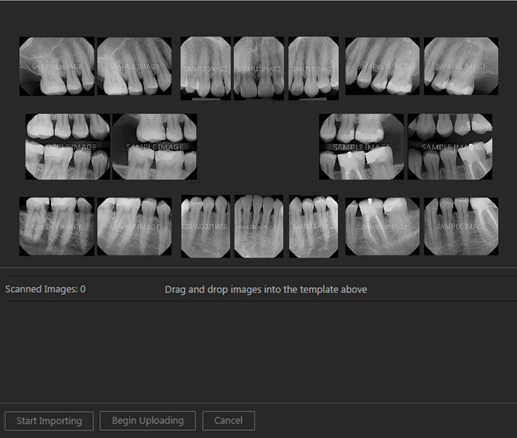 You can acquire, import, export, view, and edit 2D images and 3D volumes of dental anatomy. Dentrix Ascend Imaging supports the acquisition of images from many brands of intraoral and extraoral imaging devices, which allows you to mix and match imaging devices and brands of equipment as needed. All images that you acquire or import are uploaded immediately to the cloud, so you can access them from multiple locations for any number of users in near real time. 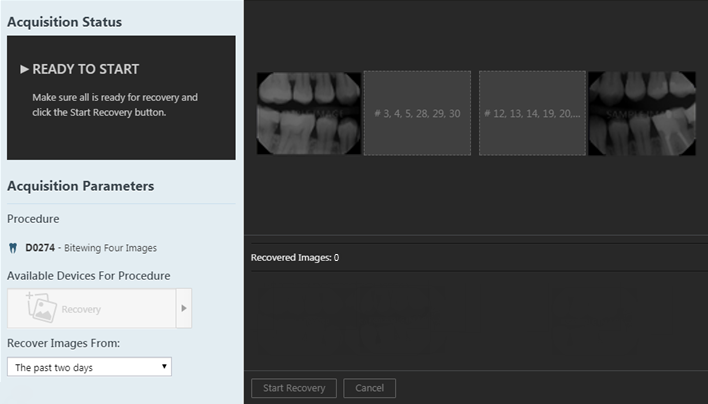 Dentrix Ascend Imaging uses world-class storage providers, and images are automatically replicated to multiple servers for disaster recovery. 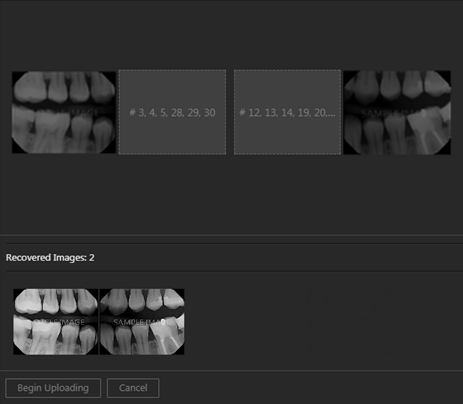 Dentrix Ascend Imaging has many image processing tools (such as filters and enhancements) that you can use on images to help determine the necessary treatments for patients. 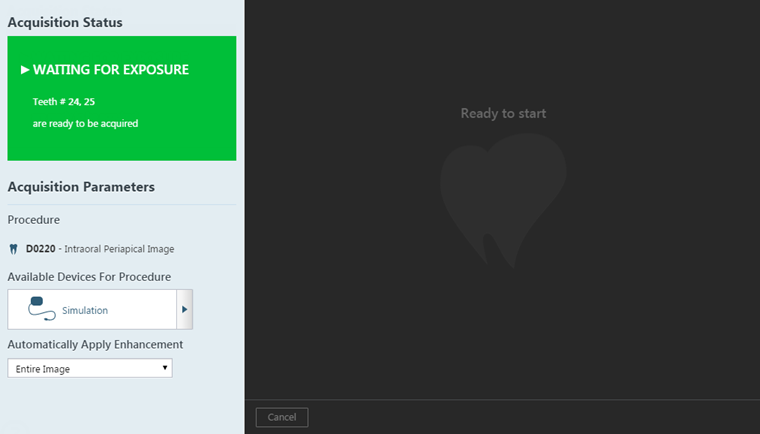 Also, you can attach images that you acquire and import to dental e-claims. Dentrix Ascend Imaging is available as an add-on and must be purchased separately from the Dentrix Ascend practice management program. 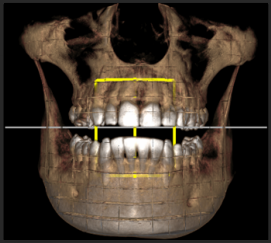 Dentrix Ascend Imaging is used for diagnostic purposes in the field of dentistry. 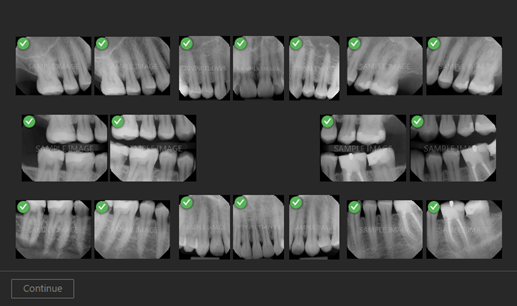 Dentrix Ascend Imaging utilizes lossless compression for all intraoral and extraoral x-ray images and which is 100% reversible and does not result in loss of data. 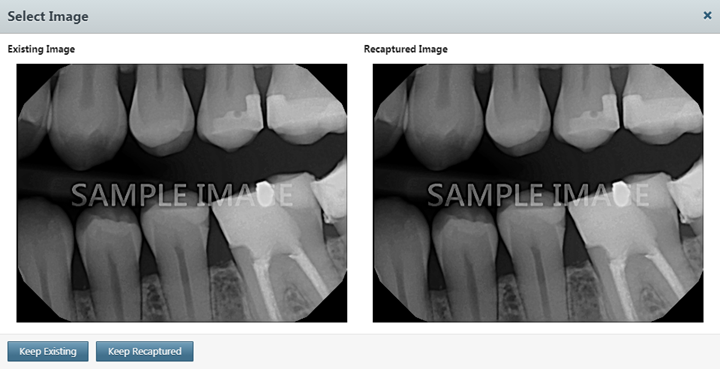 Dentrix Ascend Imaging utilizes lossy compression (JPEG) for all intraoral and extraoral color images. 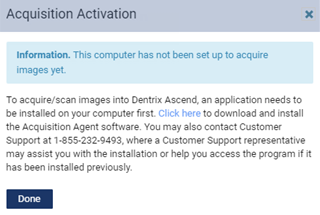 Contact Customer/Technical Support should you have any questions, difficulties using, experience any anomalies, or have comments regarding the Dentrix Ascend Imaging program. See the "Customer/Technical Support" section of this user's guide for contact information. 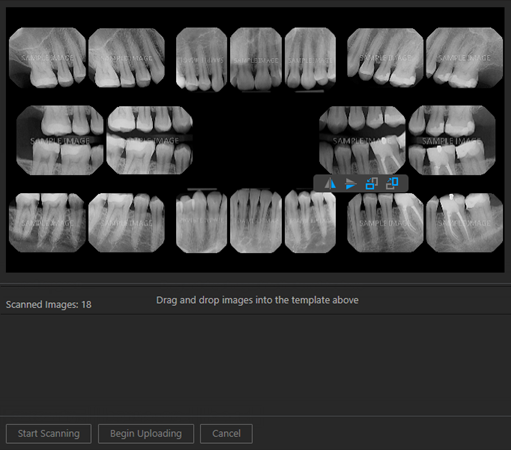 Dentrix Ascend Imaging is a web-based Dental Picture Archiving and Communications Systems (PACS), i.e. 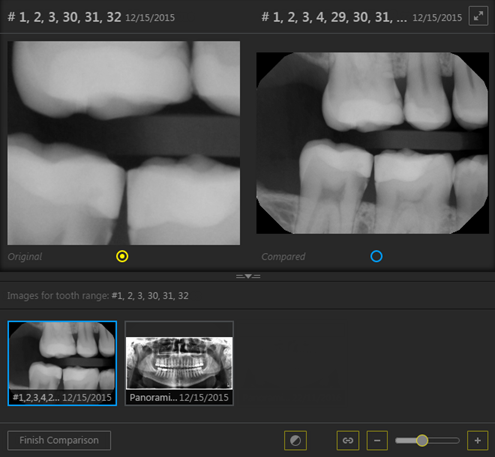 dental imaging software, that enables dental care facilities to acquire, process, edit, and enhance dental images. 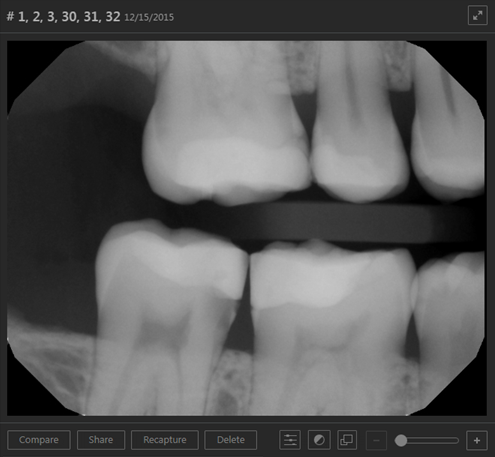 Dentrix Ascend Imaging provides a web-based interface for image acquisition and management of images which are used in the field of Dentistry and when operated by dental professionals who are responsible for providing dental care. 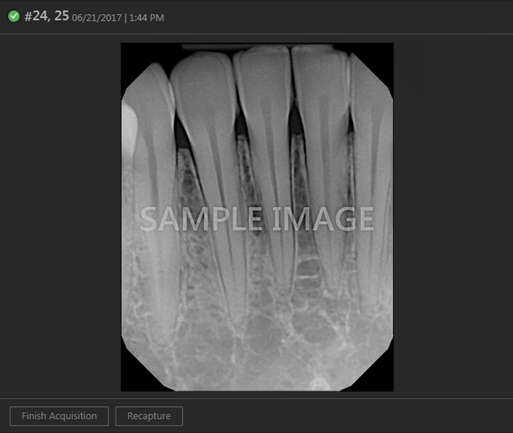 Images can be acquired from dental image acquisition devices and/or consumer imaging devices such as color digital cameras. Previously acquired images or volumes can be selected for upload directly from the user's computer. 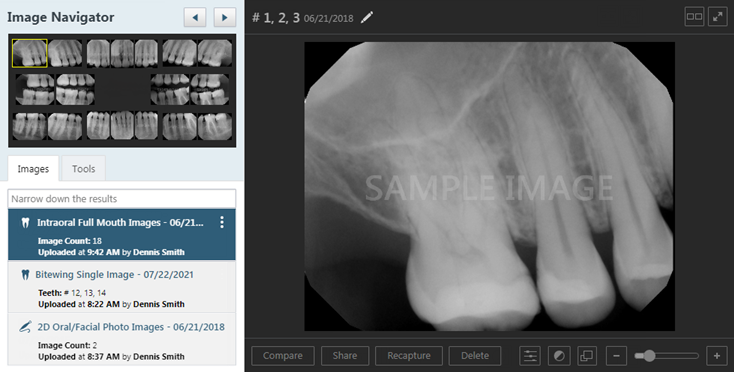 Supported images include intraoral and extraoral dental X-rays/volumes and intraoral and extraoral color images produced by intraoral video or consumer digital cameras. 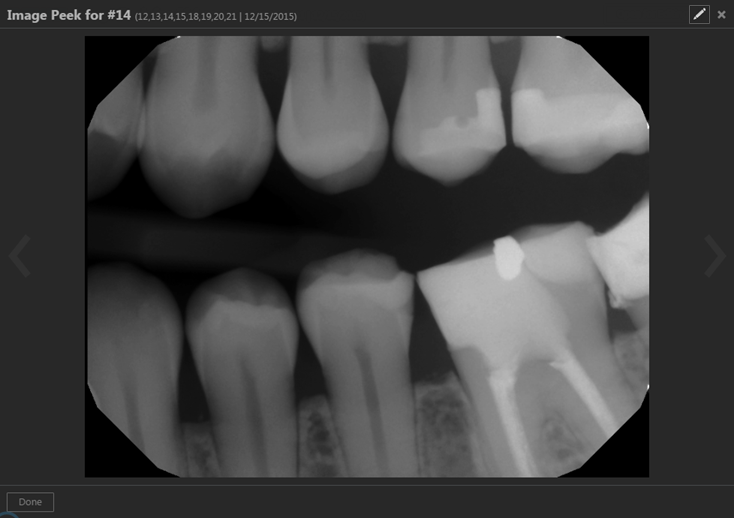 Dentrix Ascend Imaging is not intended for diagnostic use on a mobile display. Images can be edited/enhanced (e.g. zoomed, contrast adjusted, inverted, annotated, rotated, filtered, etc...) as well as exported to standard image file formats. Federal law restricts this device to sale by or on the order of a dentist. 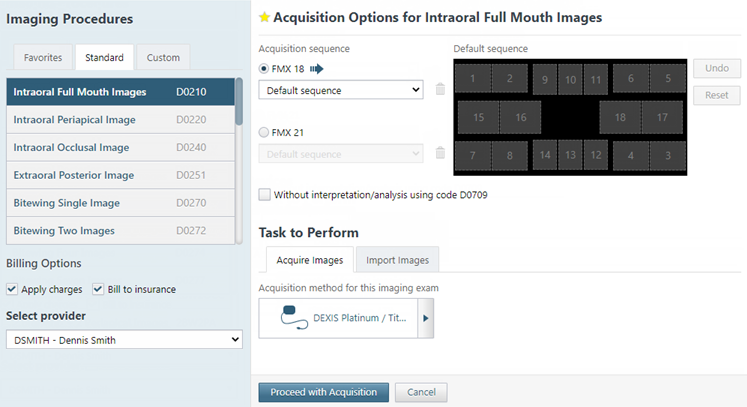 To effectively use the Dentrix Ascend Imaging program, it is Strongly Recommended that all users obtain dedicated training on the use of this software prior to use on any live patients. Read and understand the User's Guide in its entirety before using the Dentrix Ascend Imaging program upon live patients. Use of this software as a diagnostic aid must be used in combination with other diagnostic aids and clinical experience to form a diagnosis and should not be solely relied upon for diagnosis. Distance and Angle measurements require calibration by measuring length of a known object in image. It is the operator's (user) responsibility to properly calibrate prior to clinical measurements and to determine if the accuracy achieved is within the error range required. Do not operate this software upon live patients if you are feeling ill, fatigued, or if you are experiencing lack of concentration. 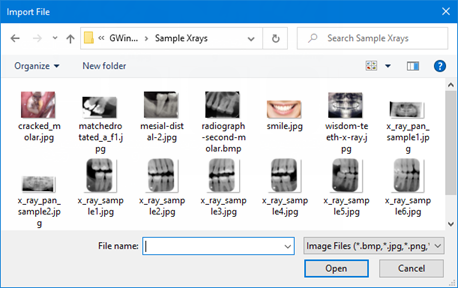 Do not leave any computer/device which is operating Dentrix Ascend Imaging unattended as this can create a security risk to patient or practice data. 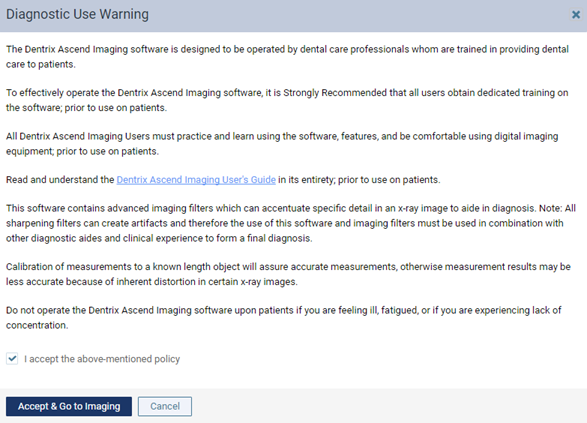 Always close the Dentrix Ascend Imaging program when leaving a computer or device unattended. Note: iPad cannot be used for acquiring images. iPad can be used only for viewing images for non-diagnostic purposes. Important: If you want to use a device other than a DEXIS device, additional costs may be required, such as the purchase of drivers, to integrate that device with Dentrix Ascend Imaging. Before you purchase the Dentrix Ascend Imaging add-on or a particular device that you want to use with Dentrix Ascend Imaging, consult the manufacturer of that device to verify if there will be costs to get that device working with Dentrix Ascend Imaging. 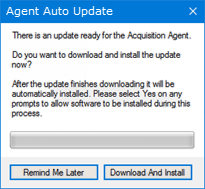 Mac users: To install the acquisition agent, please contact our support team at 1-855-232-9493. Correction File Path - For Dexis sensors, this is the default location of the calibration files (C:\Dexis\Flashdir). If the calibration files are located elsewhere, click (or tap) Browse to locate and select the correct folder. You can acquire or import a single image or a set of images. You can also quickly acquire images for selected teeth. 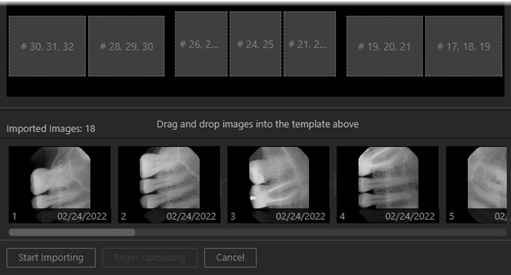 You can quickly acquire an image for the teeth that are selected on a patient's clinical chart. 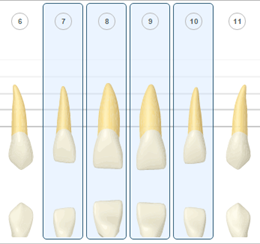 Select one or more teeth. 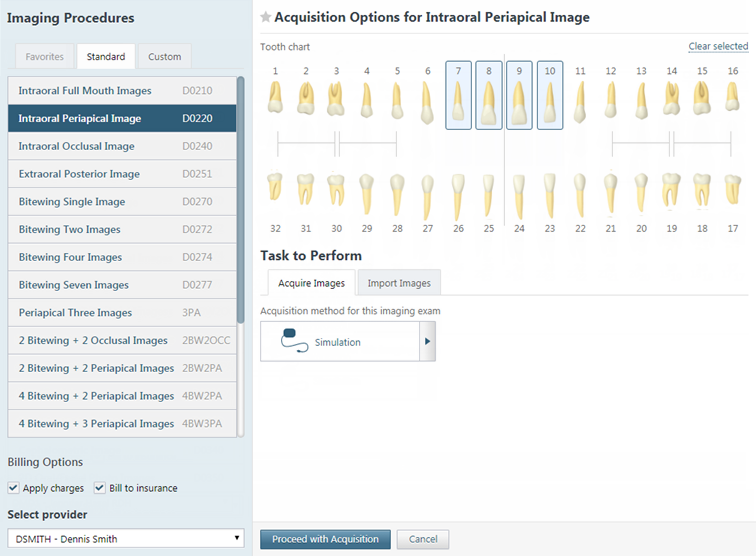 If you have selected teeth for a periapical image, on the Imaging tab's menu, click (or tap) PA Quick acquire. The options to acquire an image become available. Skip steps 5 - 8. On the Imaging tab's menu, click (or tap) Acquire images. The options for acquiring images become available. Proceed to step 5. 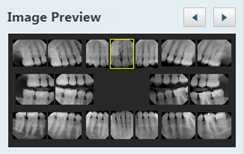 Under Imaging Procedures, select the procedure that you want to perform (an intraoral periapical or bitewing X-ray image). 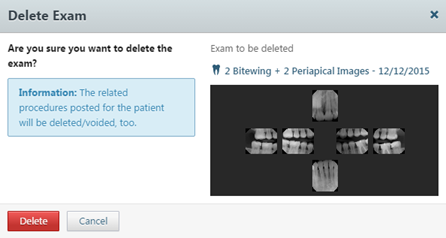 Apply charges - To post the fee for the selected procedure (such as D0220 for a periapical image), select the check box. To post a zero amount for the procedure, clear the check box. Click (or tap) Proceed with Acquisition to start acquiring an image for the corresponding acquisition type. 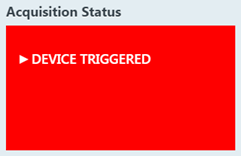 If you need to change the selected acquisition device, select the correct device on the Available Devices for Procedure list. 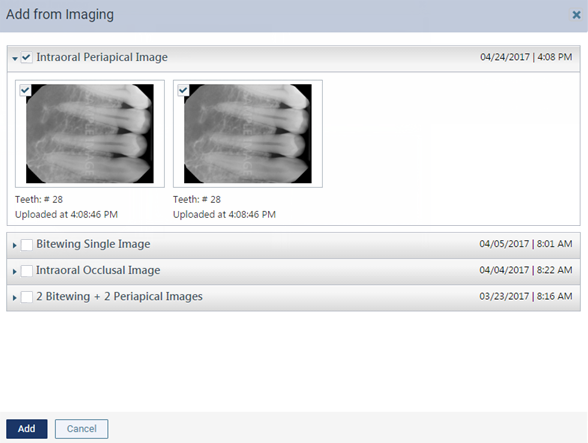 Then, the resulting image is saved to the patient's record. Then, a preview of the image appears. Click (or tap) Finish Acquisition. If you are importing images for a full-mouth series, under Acquisition sequence, select FMX 18 or FMX 21; otherwise, skip this step. Under Task to Perform, click (or tap) the Import Images tab. 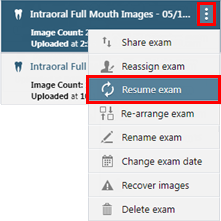 You can resume incomplete exams, retake images in an exam, and recover missing images. You can also rearrange images in a set of images. 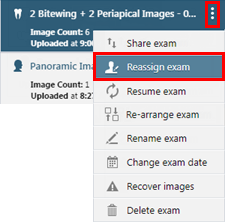 If you skipped the acquisition of any images in an exam that uses a set of images or canceled an exam before acquiring all the images, you can return to that exam and complete the image acquisitions as needed. You can also resume an exam to retake any or all of the images in that exam. Select a series (such as a full mouth series or bitewings). On the corresponding options menu, click (or tap) Resume exam. This option is available only if the exam is a series. 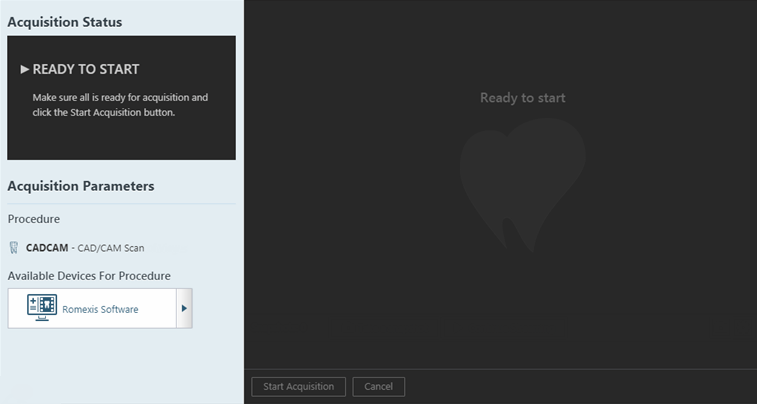 The Acquisition Options dialog box appears. The options for acquiring images in the series appear. If any images are missing, the first missing image in the sequence is selected automatically, so acquire the image. The next missing image in the sequence is selected automatically, so acquire the image. Repeat this process for any other missing images that you want to acquire as each one is selected. If you are retaking an image, click (or tap) Skip Backward or Skip Forward as needed to navigate to the desired image in the sequence. 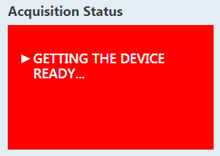 The acquisition is paused automatically. Click (or tap) Recapture, and then acquire the image. Next, in the Select Image dialog box that appears, click (or tap) either Keep Existing to keep the original image or Keep Recaptured to replace the original image with the new one. Repeat this process for any other images that you want to retake. 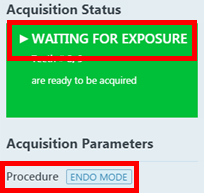 Note: When the acquisition is paused (manually or automatically), the Pause button changes to either the Recapture button (for a box in the template with an existing image) or the Capture button (for an empty box in the template). Note: Once the acquisition device is ready to acquire an image, the Cancel button changes to the Finish Acquisition button. If an individual image or any images in a set did not get uploaded to the server, you can recover those images from the computer where those images were acquired. On the corresponding options menu, click (or tap) Recover images. The options for recovering images appear. In the Recover Images From list, select either The past two days to search for images from the past two days or All time to search for images from any time in the past. Click (or tap) Start Recovery. The images that can be recovered appear in the panel at the bottom of the page. 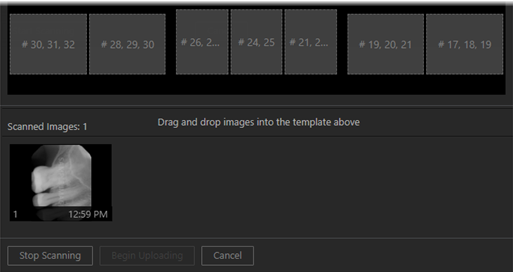 One at a time, drag the correct thumbnail images from the panel to the appropriate boxes of the template. 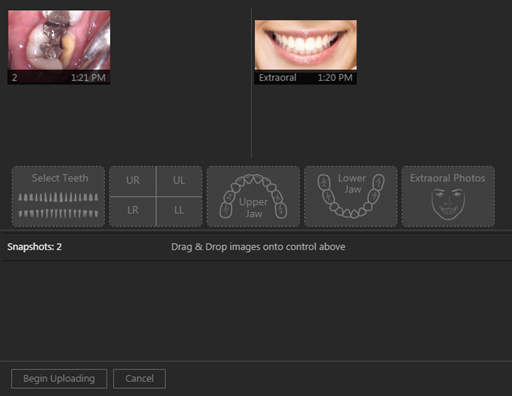 For intraoral/extraoral photos, you can select multiple thumbnail images on the panel and then drag them together. Click (or tap) Begin Uploading. You can rearrange images within an exam that uses a set of images. On the corresponding options menu, click (or tap) Re-arrange exam. 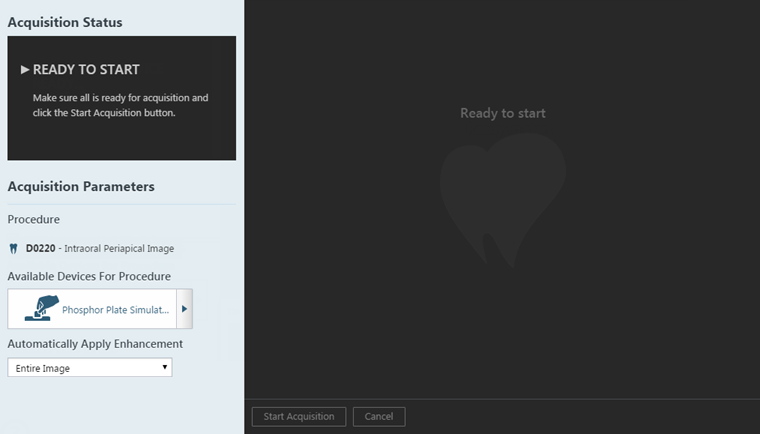 The Re-arrange Image dialog box appears. 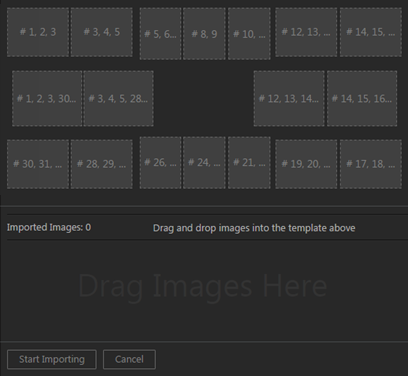 To move an image to an empty box in the template, drag the image to the desired box. 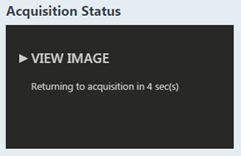 When you have moved, or changed the orientation of, at least one image, the Confirm button becomes available. When you have finished rearranging the images, click (or tap) Confirm. 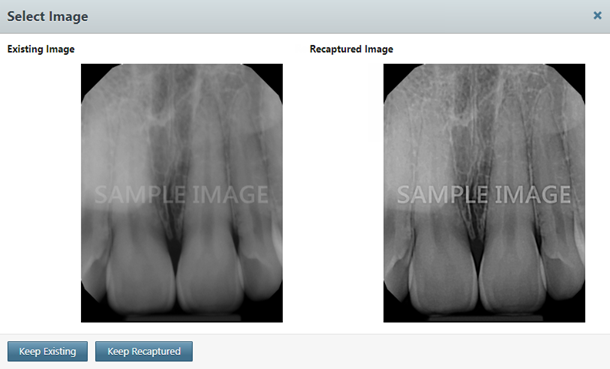 You can view the recent images and the image history for a patient. 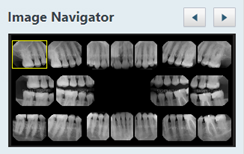 You can also quickly determine which teeth have images and view images for selected teeth. Click (or tap) an image under Image Navigator (which is "Image Preview" in single-image view mode) to view only that image. 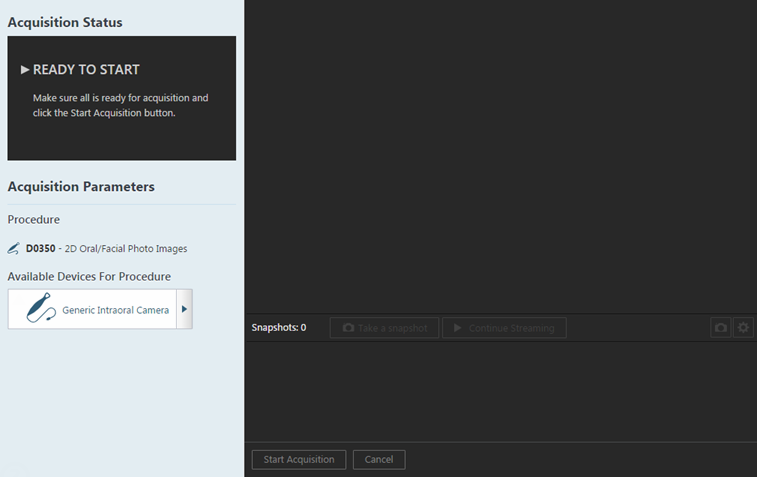 View recaptured images - If the image being displayed has been recaptured, the View Recaptured button is available. 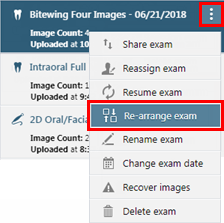 To view other versions of the image and even choose which one should be active (visible when viewing the exam), click (or tap) View Recaptured to open the View Recaptured Images dialog box. The current image appears on the left; other versions, on the right. To navigate between each version, next to Recaptured Image, click (or tap) the Previous and Next buttons . To use the image being displayed under Recaptured Image instead of the one under Current Image for the exam, click (or tap) Replace Current. 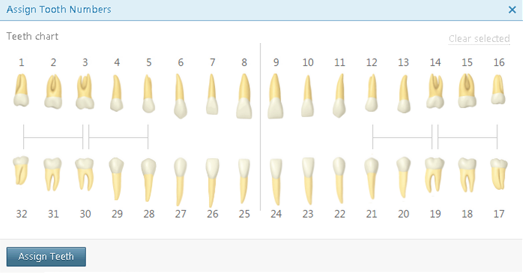 You can view images for selected teeth from a patient's clinical chart and progress notes. 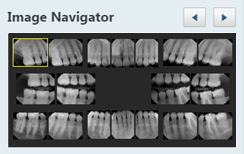 Select one or more teeth with associated images, and then click (or tap) Image Peek. 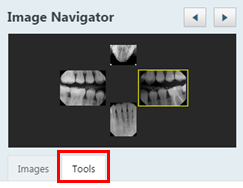 The button is available only if at least one tooth with an image is selected. Select one or more teeth with associated images, and then click (or tap) the Progress Notes tab. On the Progress Notes tab, click (or tap) the imaging icon next to a procedure. Select one or more teeth with associated images, and then click (or tap) the Quick Exam tab. On the Quick Exam tab, click (or tap) Image Peek (the button appears as a white tooth on a blue background if there is not enough room to display the button with a text label). 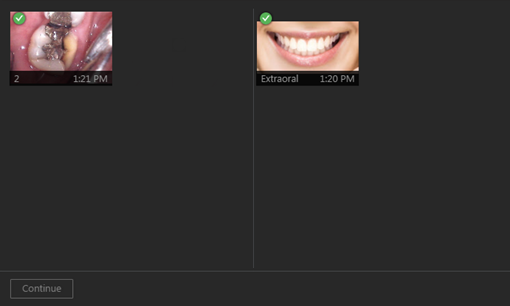 The button is available only if at least one tooth with an image is selected. The Image Peek dialog box appears. If there are multiple images, use the Back and Forward buttons to navigate between the images. To edit the image that is currently being viewed, click (or tap) Open for Edit. 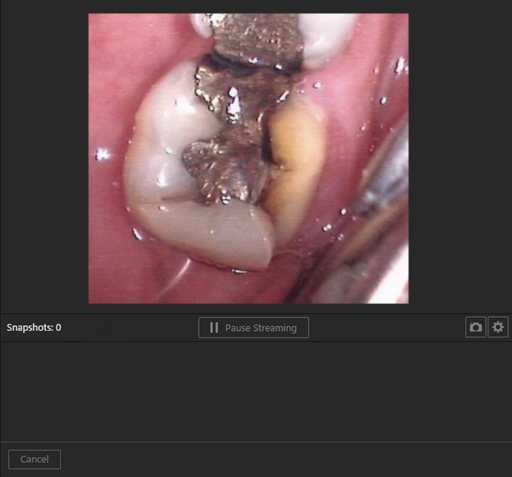 You can perform various processing tasks, such as enhancing and annotating, on images. Note: Any processing that you perform on an image is permanent (except for colorize, grayscale, and emboss, which are temporary). However, you can view the image in its original state by turning off any processing filters that you have applied. Click (or tap) the Tools tab if it is not already selected. Not Enhanced - The image is not enhanced. Entire Image - Adds a balance of sharpening and contrast levels that affects the overall sharpness and contrast. For Perio - Adds a lower level of sharpening and a gray level adjustment to accentuate the subtle differences in the grayscale values of periodontal conditions. For Endo - Adds a higher level of sharpening and contrast and a gray level adjustment to accentuate endodontic conditions. 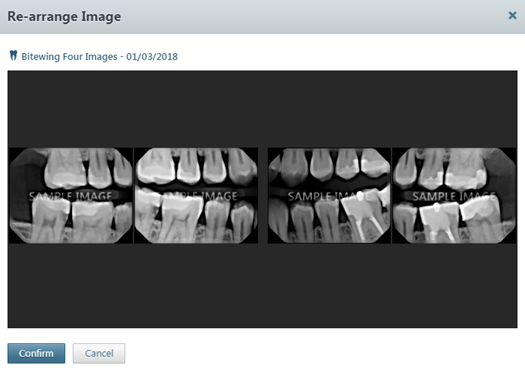 You may want to use this filter, for example, to help you to see the position of a file in relation to the root of a tooth when doing a root canal. Note: To switch between viewing the image with or without an applied enhancement, click (or tap) the Enhancement button. If the enhancement is turned on, the button is gray . If the enhancement is turned off, the button is orange . Rotate - Click (or tap) the button that corresponds to how you want to rotate the image: 180 degrees (clockwise), 90 degrees (clockwise), or -90 degrees (counterclockwise). Flip - Click (or tap) the button that corresponds to how you want to flip the image: Horizontal or Vertical. Invert - To invert the image's colors, select the Invert check box. To remove the filter, clear the check box. 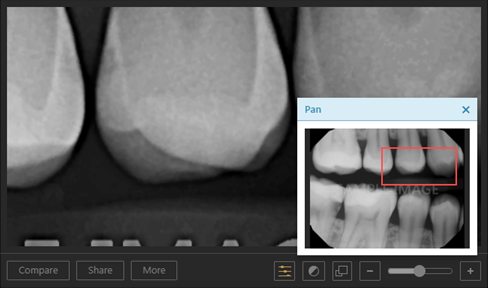 Colorize (X-rays only) - To convert the image from grayscale to color, select the Colorize check box. To remove the filter, clear the check box. This option is available only for intraoral and extraoral X-rays. 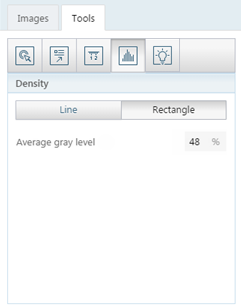 Grayscale (Photos only) - To convert the image from color to grayscale, select the Grayscale check box. To remove the filter, clear the check box. 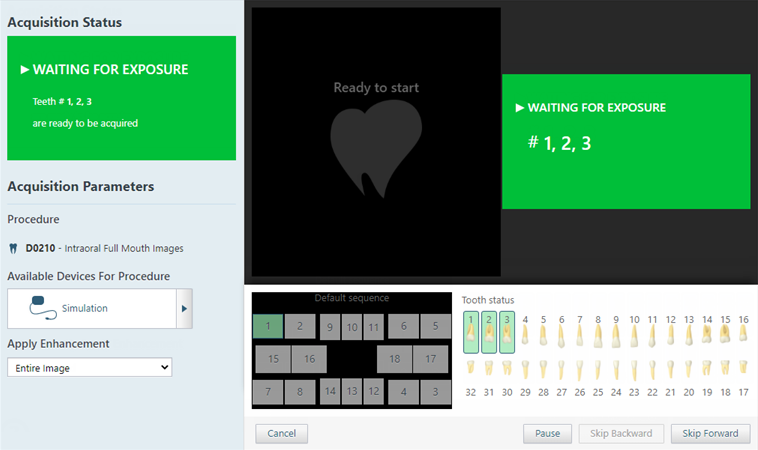 This option is available only for intraoral and extraoral photos. 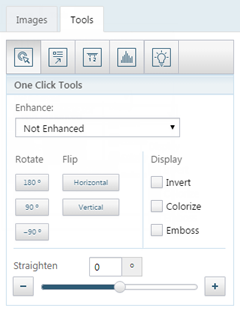 Emboss - To emboss the image, select the Emboss check box. To remove the filter, clear the check box. Set up the Drawing tools. Select a shape: arrow, rectangle, or circle. Select a color from the Colors menu, or click (or tap) one of the Last used colors. Select an Outline width: extra thin, thin, standard, wide, or extra wide. A preview of the selected line thickness that will be used for the shape appears. Click (or tap) and drag over a specific area of the image to create the shape. To remove the last annotation that you added to the image, click (or tap) Undo. To remove all annotations from the image, click (or tap) Clear All. To switch between showing and hiding the annotations, select and clear the Show check box. To switch between showing and hiding annotations and measurements, click (or tap) the Annotations/Measurements button . The button is available only if an annotation or a measurement has been applied to the image. Important: Distance and Angle measurements are calculated from specified points after calibration from an object with a known length. Image resolution, displayed size, inherent image quality, and proper calibration all affect the accuracy of the measurement results. However, the factors that have the greatest effect on the overall precision of a measurement are the accuracy of the calibration and selection of the start and end points of the actual line or angle to be measured. Using the calibration results, you can decide as to whether the overall accuracy achieved is correct for the desired measurement. Precaution: It is your responsibility to properly calibrate prior to clinical measurements and to determine if the accuracy achieved is within the error range required. To calibrate distance measurements using an object of known size in the image, click (or tap) Calibrate. Click (or tap) the first (starting) point of the known-length object on the image where you want to start measuring, and then drag to another point on the known-length object. Change the length of the Standard for calibration as needed to the correct number of millimeters for the known length. 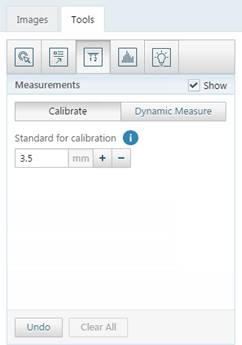 Perform the above calibration step until you are comfortable that you can measure the calibration object accurately and that the displayed results have the accuracy needed. Now that you have defined the length of the segment, all dynamic measurements will be calculated respective to that calibration. Note: For most sensors that integrate directly with Dentrix Ascend Imaging, it may not be necessary to calibrate images taken with those sensors. Click (or tap) Dynamic Measure. Click (or tap) a point on the image, then another point, and so on until you have created all the necessary lines. To remove the last measurement that you added to the image, click (or tap) Undo. To remove all measurements from the image, click (or tap) Clear All. 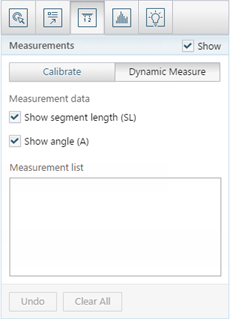 To show the calculated length of each line segment, select the Show segment length (SL) check box. To show the calculated angle where two line segments meet, select the Show angle (A) check box. To switch between showing and hiding the lines and their calculated lengths and angles, select and clear the Show check box. Important: Density measurements are calculated from specified points on the image and are reported from the actual pixel values selected. Image resolution, displayed size, and inherent image quality can all affect the accuracy of the Density measurement. However, the factor which has the greatest effect on the overall precision of a density measurement is the accuracy of the selected point or points to be measured. Click (or tap) a point on the image, then another point to create a line. 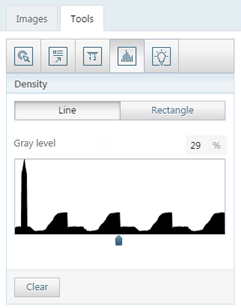 A graph of the gray levels along the specified line appears, and the Median gray level is indicated. Note: To remove the density line, click (or tap) Clear. Click (or tap) and drag to create a rectangle. The Median gray level is indicated. 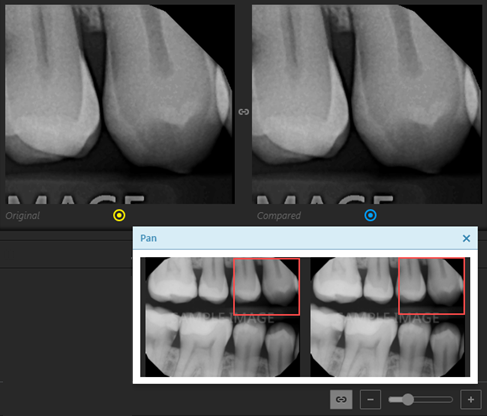 Select an Effect: Invert, Colorize (for X-ray images only), Zoom x2, Sharpen, or Contrast. Move the Spot size slider to specify the size of the spotlight. Click (or tap) a specific area of the image to place the spotlight. A spotlight with a red border appears. To move the spotlight, click (or tap) another area of the image. To suspend the spotlight on the image so that you can add other spotlights, click (or tap) Suspend. The border of the spotlight turns blue. Repeat steps a-e as needed to continue adding spotlights. Note: To remove all spotlights, click (or tap) Clear Suspended, or select another processing tool. Adjust the brightness and/or contrast as needed. Click (or tap) the Brightness/Contrast button. Move the Brightness slider to decrease or increase the brightness. Move the Contrast slider to decrease or increase the contrast. To reset the brightness and contrast levels to their default states, click (or tap) the Reset to default link. Note: If you change the brightness or contrast, the corresponding button becomes orange . 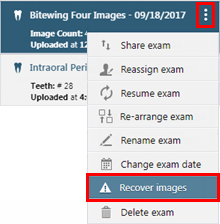 You can delete a single image or a series of images from a patient's record. You can delete images only if they are not associated with procedures that are attached to insurance claims. Notes: The procedures that are associated with the images that you are deleting will also be deleted or voided (if older than 120 days). 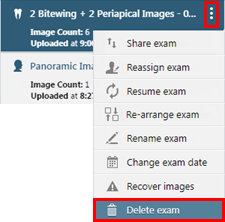 On the corresponding options menu, click (or tap) Delete exam. 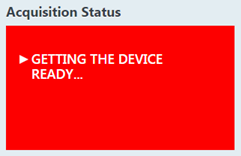 The Delete Exam confirmation message appears. You can export and print images. 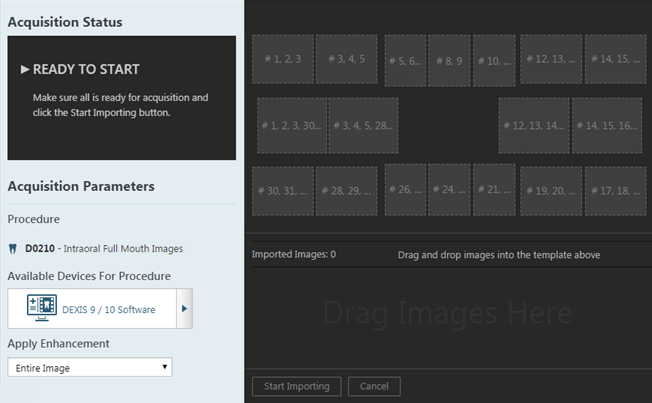 You can export an image, a specific image of a series, or an entire series (such as a full mouth series). 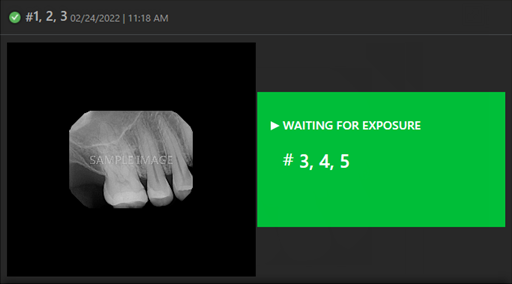 View an image or a series in the patient's image history list. The selected image (or the first of the selected series) appears in the viewing area. If you are viewing a series (such as a full mouth series or bitewings), to view a differrent image of that series, under Image Preview, click (or tap) an image. Otherwise, skip this step. To export only the image currently being viewed, or to select and export multiple images in a series, click (or tap) Share. To export the selected image or series of images, from the corresponding options menu, click (or tap) Share exam. 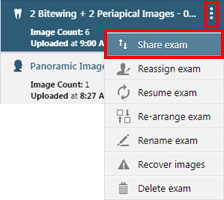 The Image(s) to be shared dialog box appears if you used the Share button, or the Share Exam or Image dialog box appears if you used the Share exam menu option. 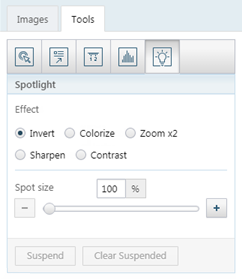 Include image enhancements - Select this check box to apply an enhancement, which adds a balance of sharpening and contrast levels that affects the overall sharpness and contrast, to any of the images being exported that have enhancement applied to their originals. Any images being exported that do not have enhancement applied to their originals will not be exported with enhancement. Clear this check box to not enhance any of the images being exported even if enhancement has been applied to their originals. 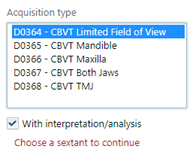 Include annotations and measurements - Select this check box to include any annotations or measurements that were added to the images being exported. Clear this check box to export the images without the annotations and measurements. 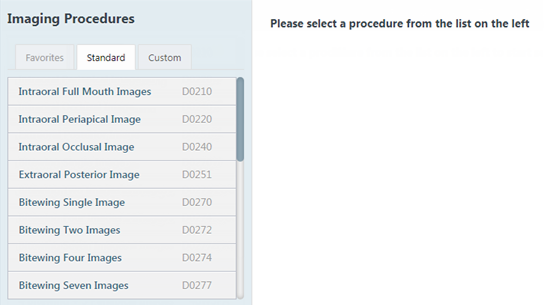 Export as JPEG (Otherwise PNG) - Select this check box to export the selected images as .jpg files. Clear this check box to export the selected images as .png files. If you are exporting multiple images, they will be saved as individual images in one compressed folder. Share exam as - These options are available only if you selected the Share exam option on the series' options menu in step 4. To export the images as one file that contains all the images, select Entire exam in one image. To export each image as an individual file, select Separate individual images. If you used the Share button in step 4, and if you are viewing a series of images, click (or tap) the desired images. Selected images have a yellow box around them. If necessary, you can click (or tap) a selected image to remove the yellow box unless only one image is selected. You can print an image, a specific image of a series, or an entire series (such as a full mouth series). To print only the image currently being viewed, or to select and print multiple images in a series, click (or tap) Share. 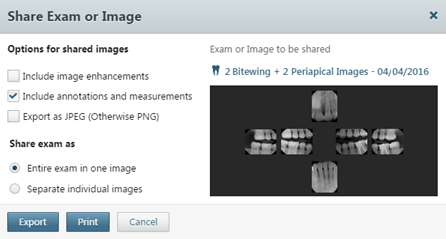 To print the selected image or series of images, on the corresponding options menu, click (or tap) Share exam. Include image enhancements - Select this check box to apply an enhancement, which adds a balance of sharpening and contrast levels that affects the overall sharpness and contrast, to any of the images being printed that have enhancement applied to their originals. Any images being printed that do not have enhancement applied to their originals will not be printed with enhancement. Clear this check box to not enhance any of the images being printed even if enhancement has been applied to their originals. 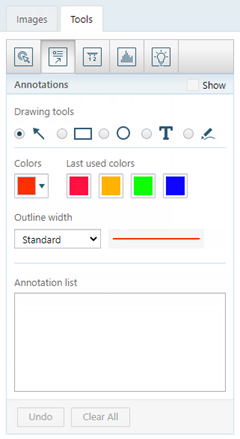 Include annotations and measurements - Select this check box to include any annotations or measurements that were added to the images being printed. Clear this check box to export the images without the annotations and measurements. Share exam as - These options are available only if you selected the Share exam option on the series' options menu in step 4. To print the images on a single page, select Entire exam in one image. 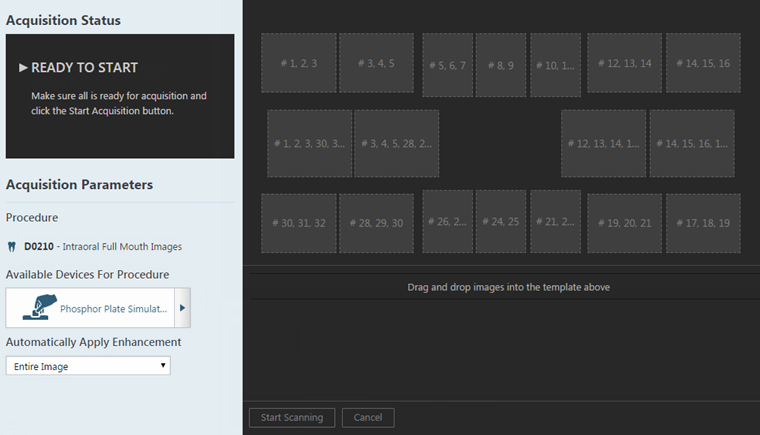 To print each image on a separate page, select Separate individual images. A .pdf file of the images is created for you to print.